1924: I fought the Apemen of Mount St. Helens, Wa. Fred Beck is qualified to tell what they are. He was one of a party of five miners attacked by them in 1924, the most famous of such incidents in North America. The incident has become a legend in the Northwest. He tells the real facts after 43 years of silence. It is my intention in this book not only to tell you about the historic encounter I had with these mysterious creatures, but also to reveal to the public what I believe they are. Truth often is stranger than fiction, but the strangeness comes from the clouds surrounding our minds, not from the mystery itself. This is not a large book, but may the largeness be conveyed by the picture I hope to paint of truth. Much has been written about that day in 1924, and I feel it right that I express my views at last. To avoid embarrassment to the relatives of the other four men involved in the 1924 incident, I have not directly mentioned their names. The name, Hank, is a pseudonym of one of the main characters in the incident. First of all, I wish to give an account of the attack and tell of the famous incident of July, 1924, when the “Hairy Apes” attacked our cabin. We had been prospecting for six years in the Mt. St. Helens and Lewis River area in Southwest Washington. We had, from time to time, come across large tracks by creek beds and springs. In 1924 I and four other miners were working our gold claim, the Vander White. It was two miles east of Mt. St. Helens near a deep canyon now named “Ape Canyon” — which was so named after an account of the incident reached the newspapers. Hank, a great hunter and good woodsman, was always a little apprehensive after seeing the tracks. The tracks were large and we knew that no known animal could have made them: the largest measured nineteen inches long. It was in the middle of July, and we had received a good assay on our claim, and everyone was excited. I remember I had a tooth that was aching, and I suggested to Hank that he should take me to town to see a dentist; but he was so enthused in the prospects of the gold mine, he barely took time to answer me. He replied that “God or the Devil” could not get him away from there. We had all come up in his Ford, and I had no way to get to town unless he took me. So when we went back to our cabin, on the north side of the canyon, I had a nagging tooth ache and little appetite for our evening meal of beans and hotcakes. Hank, though apprehensive, was still determined. We had been hearing noises in the evening for about a week. We heard a shrill, peculiar whistling each evening. We would hear it coming from one ridge, and then hear an answering whistling from another ridge. We also heard a sound which I could best describe as a booming, thumping sound — just like something was hitting its self on its chest. Hank asked me to accompany him to the spring, about a hundred yards from our cabin, to get some water, and suggested we take our rifles — to be on the safe side. We walked to the spring, and then, Hank yelled and raised his rifle, and at that instant, I saw it. It was a hairy creature, and he was about a hundred yards away, on the other side of a little canyon, standing by a pine tree. It dodged behind the tree, and poked its head out from the side of the tree. And at the same time, Hank shot. I could see the bark fly out from the tree from each of his three shots. Someone may say that that was quite a distance to see the bark fly, but I saw it. The creature I judged to have been about seven feet tall with blackish-brown hair. It disappeared from our view for a short time, but then we saw it, running fast and upright, about two hundred yards down the little canyon. I shot three times before it disappeared from view. We took the water back to the cabin, and explained the affair to the rest of the party; and we all agreed, including Hank, to go home the next morning as it would be dark before we could get to the car. We agreed it would be unsound to be caught by darkness on the way out. Nightfall found us in our pine-log cabin. We had built the cabin ourselves, and had made it very sturdy. It stood for years afterward, and was visited by many sight seers until a few years ago when it was burned to the ground — the circumstances of the fire, I do not recall. In the cabin, we had a long bunk bed in which two could sleep, feet to feet — the rest of us sleeping on pine boughs on the floor. At one end of the cabin, we had a fireplace, fashioned out of rocks. There were no windows in the cabin. So darkness found all of us in the cabin, more calm now (and my tooth was better, somehow the excitement seemed to work a temporary cure on it). We were sitting around, puffing on pipes, and talking about the trip home the next day. Each of us settled down in his crude, but welcomed bed, and soon fell asleep. About midnight, we were all awakened. Hank, who was sleeping on the floor was yelling and kicking. But the noise that had awakened us was a tremendous thud against the cabin wall. Some of the chinking had been knocked loose from between the logs and had fell across Hank’s chest. He had his rifle in his hand and was waving it back and forth as he kicked and yelled. (Hank always slept with his gun near by — it was a Remington automatic, my gun being a 30-30 Winchester, which I still have). I helped to get the chinking off him, and he jumped to his feet. Then, we heard a great commotion outside: it sounded like a great number of feet trampling and rattling over a pile of our unused shakes. We grabbed our guns. Hank squinted through the space left by the chinking. By actual count, we saw only three of the creatures together at one time, but it sounded like there were many more. The only time we shot our guns that night was when the creatures were attacking our cabin. When they would quiet down for a few minutes, we would quit shooting. I told the rest of the party, that maybe if they saw we were only shooting when they attacked, they might realize we were only defending ourselves. We could have had clear shots at them through the opening left by the chinking had we chosen to shoot. We did shoot, however, when they climbed up on our roof. We shot round after round through the roof. We had to brace the hewed-logged door with a long pole taken from the bunk bed. The creatures were pushing against it and the whole door vibrated from the impact. We responded by firing many more rounds through the door. They pushed against the walls of the cabin as if trying to push the cabin over, but this was pretty much an impossibility, as previously stated the cabin was a sturdy made building. Hank and I did most of the shooting — the rest of the party crowded to the far end of the cabin, guns in their hands. One had a pistol, which still is in my family’s possession, the others clutched their rifles. They seemed stunned and incredulous. A humorous thing I well remember was Hank singing: “If you leave us alone, we’ll leave you alone, and we’ll all go home in the morning.” He did not mean it to be humorous, for Hank was dead serious, and sang under the impression that the “Mountain Devils” as he called them, might understand and go away. The attack ended just before daylight. Just as soon as we were sure it was light enough to see, we came cautiously out of the cabin. It was not long before I saw one of the apelike creatures, standing about eighty yards away near the edge of Ape Canyon. I shot three times, and it toppled over the cliff, down into the gorge, some four hundred feet below. Then Hank said that we should get out of there as soon as possible; and not bother to pack our supplies or equipment out; “After all,” he said, “it’s better to lose them, than our lives.” We were all only too glad to agree. We brought out only that which we could get in our packsacks. We left about two hundred dollars in supplies, powder, and drilling equipment behind. I tried to persuade everyone not to relate the happenings to anyone, and they agreed, but Hank soon let the cat out of the bag. We made our way to Spirit Lake, and Hank went in to the ranger station. He had told the ranger earlier about the tracks, and the ranger had replied, “Let me know if you find out what they are.” That was just what Hank did, to the puzzlement of the ranger. When we were back home in Kelso, Washington, he told some of his friends, and somehow the story leaked out to the papers, and the Great Hairy Ape Hunt of 1924 was on. Local reporters interviewed us. 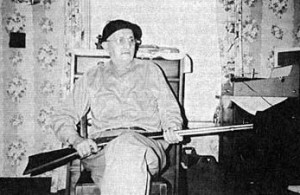 They came from Portland and Seattle — even a big game hunter from England came asking questions, and he had a large gun with him that must have been an elephant gun. Many people flocked to the Mt. St. Helen’s area looking for the “Great Hairy Apes”, or “Mountain Devils.” I, myself, went back with two reporters and a detective from Portland, Oregon. We found large tracks, and they photographed them. We did not see any of the Apemen then, nor could we find the ones we had shot. So people were asking questions: Was it true? Or was it just a wild tale? I can assure you it is true. Are they human? animal? or devils? I will answer that question in this book. That was a great “Apehunt” in 1924, and the last few years, more and more people have reported seeing them. There is an Apehunt being revived again, and another man has written a book on the subject and has formed a club whose purpose is to find evidence to prove what they already believe: that abominable snowmen of America do exist. A wealthy person has offered a large sum of money for anyone that can capture one alive. Sightings have been reported in Canada, Washington, Oregon, and northern California. But the purpose of this book, is not only to relate my experiences, but also to bring to light my knowledge about the Abominable Snowmen. I do not wish to embark upon an expedition, but I wish to tell what these beings are. The legend of the apemen of Mt. St. Helens returns, like hay fever, with summer weather. 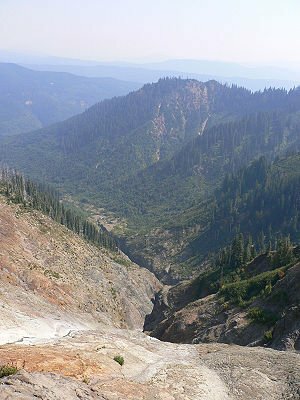 The story of the apemen of the beautiful conical mountain situated in the Cascade Range of Southwest Washington, is a favorite in the area, but it just may have some basis in fact. There is more basis to support it than Nepal’s Yeti or northern California’s “Big Foot” and probably as much as Loch Ness’ monster. Last summer, two different Portland groups who visited the region reported sighting the monsters, usually described as from 7 to 10 feet tall, hairy and either white or beige-colored. A Portland couple fishing on the Lewis River south of the mountain saw a huge beige figure “bigger than any human” amble off into the brush. Old timers aren’t surprised, just amused. The apeman legend actually is older than the white man’s habitation of the Pacific Northwest. Forestry employes have investigated many reports of the strange creatures. According to Indian legend, the “apes” were the ferocious Selahtik Indians, a band of renegades much like giant apes in appearance who lived like wild animals in the secluded caves of the Cascades. The first recorded encounter of the apes with white men was in 1924. A group of five prospectors rushed into Kelso to report that a group of great, ape-like creatures had attacked them in the middle of the night. Then came the “great ape hunt 0f 1924.” Law enforcement officers and a flock of newspapermen made up a posse that went into the area. The armed searchers fired at anything that moved, so the report went. They returned to tell of finding huge footprints, but no apes. The legend grew from that point for several years, then subsided with only sporadic reports of traces of the apes. Responsible persons, experienced mountaineers and skiers, have given credence to the story. He was a member of a party that searched for Jim Carter, an experienced skier and mountaineer, who vanished on the mountain in 1950. His disappearance remains a mystery. Carter, he said, had climbed the mountain with some companions on a warm, clear Sunday. He left the group to take a picture and said he would ski to the left of the group. He was never seen again. His tracks, however, indicated that he suddenly took off down the mountain in a wild, death-defying run that no experienced skier would make — unless he was pursued, Lee said. The track went in the direction of Ape Canyon. But no trace of Carter or his equipment was found although the area was combed for two weeks. Lee recalled stories of about 25 persons who claim they had encountered the monsters during a 20 year period. The canyon named for the apes, is a lonely, ominous spot in a wild area. It extends to a point near Ape Cave, thought to be the longest unitary lava tube in the world. There have been many reports of footprints in the area. Some are described as being about 18 inches long and seemingly human. Unless the creatures are really fuzzy throwbacks, the lost Indian tribe theory seems most likely to some of the fans of the mystery. It has given rise to some suggestions, one of which is to leave well enough alone. The government might take over and shove benefits and subsidies at them — retroactive to the Ice Age. And that, as well as costing a lot of money, would ruin a very good legend. In the first chapter I told about the attack, and now I want to go into the background, and tell a little concerning our activities. They will be colorful, and from them emerge a spiritual and metaphysical understanding of the case. First of all, I hope this book does not discourage too much those interested souls who are looking and trying to solve the mystery of the abominable snowmen. If someone captured one, I would have to swallow most of the content of this book, for I am about to make a bold statement: No one will ever capture one, and no one will ever kill one — in other words, present to the world a living one in a cage, or find a dead body of one to be examined by science. I know there are stories that some have been captured but got away. So will they always get away. I say this confident by the evidence of my experiences, things that I have not before revealed to the public, and I also say it from the knowledge gained on the subject later. In this book I will reveal thoroughly what I know them to be. First of all I will say that ‘they are not entirely of the world.’ I know the reaction we experienced as these beings attacked out cabin impressed many with the concept of great ape-like men dwelling in the mountains. And I can say that we genuinely fought and were quite fearful, and we were glad to get out of the mountains but I was, for one, always conscious that we were dealing with supernatural beings, and I know the other members of the party felt the same. I went home and found it, and as far as I knew then it was the same one. But years later I found the one I lost. It was weather beaten and the rubber was rotten. I would be sleeping on the hard benches of the Adventist Church my folks used to attend, and I would have my head in a lady’s lap, only when I mentioned it to my folks, they said there was no one else there and took it to be a boy’s musings. As I grew older, I saw visions and eventually I was holding spiritual meetings. After 1924 I spent many years in healing work. Our time spent in Mt. St. Helens was a series of psychic experiences. The method we found our mine was psychic. I am mentioning these facts to help build a background of understanding in a case which has been wholly explained in a material sense. As I will explain the mysterious realities of the Abominable Snowmen, so must I show some of my inner experiences, for in my mind the two have always been closely connected together; and as I will show, these beings bear a direct association with the psychic realm. There was another spiritual being which appeared to us — more in the role of a comforting friend, and we learned her name. One of our party suggested later that we name our mine after her; and so the mining claim we later filed bore her last name. The big Indian being told us there would be a white arrow go before us. Another man, who was not present during the attack in 1924, could see the arrow easily and clearly at all times. And I could see it nearly as well. So we started by the Lewis River, south of Mt. St. Helens, and went up the Muddy River, and in all we followed the white arrow four days. The going was slow, for in those days it was very rugged territory. Hank’s temper was growing short as he climbed the hills. He had always been a believer of spiritual things, and afterwards he was a believer. But he lost his temper and cussed. He swore at the spirit leading us. His face was red and we could not stop him: “Just a wild goose chase,” he exclaimed, “they lied to us, and got us running all over the hills, and I want nothing more to do with them.” He went on and on. Then just when he had started to calm down, we all saw the arrow soar up high, change direction and swoop down. We had to follow in the general direction before we could find it again. It hovered near the top of the north cliff of Ape Canyon. That was the site where we later blasted out our shaft. With those words, he disappeared. Then we saw the door slowly close. There was a huge lock and latch, but as the door shut, the lock did not latch: a closed door but it was not locked! “We just as well pack up and go home,” one of the party said. And that is just the way our gold mine turned out — closed but not locked. We worked that mine for two years, and one assay showed well over 2,000 dollars a ton. But as it turned out, what we had actually done was to cut the leaders. There is a pocket of gold in that cliff if someone is fortunate enough to find it. We gave up looking for it. The picture I am trying to paint for you is a picture of manifestation. In this book I have showed also some of our high manifestation, as we had many of a high nature the six years we spent in the Mt. St. Helen’s area. Of course, the lower or grosser manifestations were in the appearing of these hairy creatures called Abominable Snowmen — also called Hairy Apes, Bigfoot and Sasquatch, according to the region they are seen in. I believe they have always existed, although our encounter with them in 1924 was the first major report of anyone coming in contact with them. Other writings have documented the cases very well. I just like to show the reason for their appearances. For six years all had been peaceful. We were simple men and hard working men, and an aura of good or spiritual power surrounded us. We had seen the tracks, but the makers of them had left us alone. No one was really worried about the tracks as regarding any threat to our safety. But after one of us had lost his temper and denounced the spirit leading us a liar, from that time on, a quiet apprehensiveness settled over us. We continued working our claim, but down deep we felt it would avail to no good end. We had bursts of enthusiasm but no success. And yet we did have success, because we learned. Nothing can replace experience as a teacher. There is no doubt in my mind that these beings were present and observing us, but they had not yet appeared in physical form. There was no third step. This is certainly another indication of what I’m saying about manifestation. I have heard it said that many ages ago the Rocky Mountain and Cascade Mountain Ranges were a center of a great civilization. I do think the mountain areas are extra sensitive to spiritual vibration, usually of a higher order, but sometimes lower. We ourselves being extra sensitive to spiritual vibration, probably had come into contact with the manifestation of these being easier than, perhaps, the average person would have. On the subject of the Snowmen I am not going to say Masters told me this or that. It would perhaps look impressive, but I want to keep the record straight. Masters have appeared in our home and talked with us, but not once do I recall asking them anything on the subject. Since that day in 1924, I have went on and progressed and have learned much, and now I can look back and put the puzzle together from the reservoir of knowledge I have learned. In the true sense everything in the material world is a manifestation. Ever since the time the first essence of consciousness formed from the Great Void we cannot describe, different planes or dimensions of being were created or manifested. Occasionally we of this dimension of space can be conscious of other beings of a different vibration and consciousness. The The Abominable Snowmen are from a lower plane.When the condition and vibration is at a certain frequency, they can easily, for a time, appear in a very solid body. They are not animal spirits, but also lack the intelligence of a human consciousness When reading of evolution we have read many times conjecture about the missing link between man and the Anthropoid Ape. The Snowmen are a missing link in consciousness, neither animal nor human. They are very close to out dimension, and yet are a part of one lower. Could they be the missing link man has been so long searching for? The Human Soul once dwelled in a spiritual body, and eventually incarnated, at the fall of man, into bodies like we have now. The beings we call Abominable Snowmen were not of the necessary high development to incarnate in human form. They had not reached that scale of spiritual evolution. They are the easiest beings materialized as evidenced by the many reports of their appearances to more people in recent years. In fact, if the vibratory influence right for them is present they can manifest without any human being present at all. This accounts for the many tracks being seen along the mountain ranges of the West Coast and Canada. When this age or cycle of life that we are in moves on eventually to a higher cycle, and all life moves forward, these beings may stay and move up in consciousness in some other world in the far distant future. Perhaps the Ape Beings will toil the road of intelligence in that world which none of us can even imagine, and perhaps they too will lose nothing and gain by their experience. Most theories picture the Snowmen as material beings hiding in caves, and scampering over the mountains. The law of probability would be that eventually one would be found if their bodies were of physical construction only. If one claims only the physical laws to explain their existence, then we can use a material logic to prove or disprove the premise. If they are material life definite material evidence would surely be found. What material evidence we do have, in my opinion which I believe firmly to be true, only shows material extrances into this plane, followed by the supernatural exits back into their own realm. I and my companions have shot them, but could find no trace of them. If they were material life like we know it to be on this globe, one would die naturally or accidentally and the remains be found. The easy way out for lots of people is to just consider it a wild tale. But too many people have seen them and the evidence is piling up to definitely prove this. The same line of escapism of thought concerning phenomenal sightings of Flying Saucers is evident. A report recently showed 5,000,000 Americans claimed to have seen Flying Saucers. Material things usually make a big splash in the material world, and spiritual things often do not make a ripple there. Why? We can give proof of a phenomenon, but its nature is immersed in the Spiritual and can only be explained by laws of the spiritual. But these happenings that seem strange to people is serving a very useful purpose — it is causing more people to think, and that is a path in the right direction. The Abominable Snowmen are just one small mystery among many. Some day more people will conceive that the greatest proportion of life is a mystery, and he will seek and find solutions to them, and then the mysteries will be unveiled in their pure forms; and from that unveiling man will find greater life. Manifestation is made possible by vibration of power and certain fine substances. Beings manifested can be seen, heard, and take a definite form — sometimes less tangible but also, under other conditions, take a very tangible form. I want to tell you a very amazing experience I had in my mining days at Mt. St. Helens. I was walking from Spirit Lake on the trail. It was in the afternoon and I was feeling a little lonely. As I came around a curve in the trail, I met a very pleasant, beautiful young lady. She began talking with me just as though she had always known me and had casually met me again. She said her father was hunting and that she was headed back to her camp. She had a jacket with her, and she let me pack it as we walked along the trail together. She told me all about herself and her father stating that she and her father came up every summer for an outing, to hunt, and to enjoy the beauties of nature. She was one of the most pleasant persons I had ever talked to in my life. When we parted, she told me where she and her father were camped, and asked me to visit them that evening. I went, and had to walk about a mile. Her camp was east of ours, and quite a distance for a young lady of eighteen, I thought, to wander around in away from her father. When I arrived at her camp, I did not see her father, and never did see him. She had a fire going, and a light colored blanket was spread out and she was sitting on it. It was a warm summer evening, and we held another pleasant conversation. I remember her telling me how she liked the fresh air of the mountains, and how wonderfully she loved nature. She would be talking on a subject, then pause and say, “Isn’t that right, Dad?” This she said several times. There was no tent, cooking utensils, no food, and certaiply no visible father. The most amazing thing was I did not at the time think her different than any other person. When she spoke to her invisible Dad, I felt just like her Dad was there. I left her and walked back to camp, but my mind seemed like it was a thousand miles away. I could hear the other men talking, but it seemed like they were below me, and their voices sounded soft and distant. I do not know anyone who had seen her but myself. One day we needed a pencil to make a description of our claim. We found we had not brought one along with us. Everyone was a little put out. But then it came — a pencil was in my hand. It had tooth marks all over it. When that trip was over and I was home, I showed the pencil to my wife, and she said, “Why, that’s a pencil I bought when you were gone. How did you get it?” She said my oldest son, then a young tot, was chewing on it and she took it away from him and had put it in a drawer. She went and looked and she found no pencil. It is the time for the world to picK up its ears about the subject of psychic phenomenon, and this more people are doing, but if there is a phenomenon, there is also a world from which its qualities are manifested. An Indian once told me if I ever saw a “Selahtik” to make sure I expressed to them that I was friendly, and the way to do it, he said was to take some cedar boughs and wave it at them, and in that way they would know I had come in peace. When I speak of Abominable Snowmen as being an lower order of life I was not inferring that they are evil or bad. They just function on a plane lower than the human plane. Neither are they completely dull minded with no sense of what they are doing. In some of their encounters with people, they have displayed quite a degree of cleverness. Some people have claimed to have been kidnapped by Abominable Snowmen. I can neither affirm nor deny this by any knowledge I have on the subject. Is it not one of the hardest tasks of life to separate precious pebbles of truth from out of the quarry of profession? Yet it is our supreme task to separate them — by our enlightenment, forsaking the shadows with light that will banish the shadows. I once found a cave which is located near the point where Ape Canyon Creek empties into Bear Lake. It was about 12 feet wide and 20 feet in length. The cave was just a few feet above the waterline. I entered the cave and found a whole heap of fish bones. Bones of other animals were plentiful too. What is the diet of the Snowmen? This incident could possibly shed some light on the question. Of all the newspaper articles written about the experience in 1924, I only have two. In another book out now there are dozens of reprinted stories telling of people’s encounters with Abominable Snowmen. The main purpose of this book is to tell my experiences. In the early articles there was much skepticism expressed, but down through the years the experience has evolved into an attitude by the local papers of fond, though mildly skeptical, folklore. It is a story that sounds interesting to many people, and they have revolved it into a legend. Recenty I have heard that there are plans to make the Ape Canyon location into a State Park. Our mine, The Vander White, was located on the cliff of Ape Canyon, north side, and we had to use ropes to get up and down. There was a small ledge there, but we blasted a larger one. Some stories state we used pack horses to pack our ore out, but the fact is that we never took any out. A few nuggets was the only gold I ever obtained, and they were found in different locations. Some stories say thatwe must have experienced a rock slide, and fabricated a tale of Apemen attacking our cabin. This could only have been written by someone who has never been there. As previously stated there are very few rocks there and there was certainly no slide. When I returned with the reporters, we found the things we left behind all strewed around in the cabin. To this day, I do not know what became of the blasting powder we left behind. Even before our experience in 1924, I heard reports of little sapling trees being twisted apart. And I, myself, saw the same things in the Mt. St. Helen’s area. Some I saw were freshly twisted. Work of the Abominable Snowmen? No man had that much strength. When I wrote of the psychic nature of these beings, I showed how people had come to see them. The manifestation takes place as a result of an energized substance surrounding these beings. To what degree the average person sighting them has a part in this, I am not prepared to say. But I do know that some persons who are psychic have a degree of involvement in a sighting and help trigger the phenomenon. Now, for a little while, let us look backward in time and consider the origin of Abominable Snowmen. As we are departing from our understanding of what we know them to be today, and are going back infinitely in time, we are looking into a past land unexplored except by a few adept ones. I received this glimpse of time by inspiration but present it to you as a theory — for such it has to be. A man would be a fool if he stated such intangible explorations to be absolute fact. But an exploration is a starting point right or wrong in its conclusions. Someone may challenge it by presenting a better concept — or add to it, or take a little away. So let us look back many thousands of years in time: Before man incarnated in a physical body, the earth was much different than it is today. The air had much moisture and you and I, of today would not have been able to breathe it. Strange creatures were roaming the earth and flying through the air. These creatures were all intermingled — many, many kinds of materiality. Some were conscious of the other and some were not conscious of the other. The appearance of these creatures was such that we could only call them monstrosities. Some of these imperfect creatures slowly died out, or their kind of materiality ceased to exist in the same form and changed and went back into the universal source. Their form of consciousness incarnated again ages later in a higher life, namely primitive animal life. In the case of others of a different construction they evolved into nature spirits. Some retained their nature, changing very slowly, and remain on lower planes. The beings we are considering in this book had their origin in this period of great chaos, evolving very slowly to their present nature. I do not wish to go beyond this point, and so let us return to the present. I have found that most Indians know more about Abominable Snowmen than one white man in a thousand. After the incident of 1924 I visited a dentist to have a tooth pulled. It was a little town in Eastern Washington. 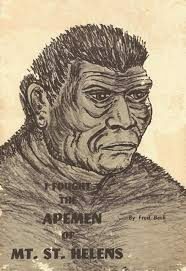 As I was coming out of the dentist office a man came up to me and asked: “Are you the man who I read about in the papers who was attacked by Apemen?” I told him I was. He took me to a tavern where he introduced me to 10 or 12 Yakima Indians. They wanted to make sure I was the man, and when they were, and after asking me some questions, they told me about the “Selahtiks”, the name by which they knew the Abominable Snowmen. They said the Indians knew about them, but white men never believed the tales of Indians. They said they were very careful never to go where they knew them to be, and if they ever found themselves in their presence they were doubly careful not to offend them. They told me the “Selahtiks” migrated into Canada, and in fact traveled the mountain ranges nearly to Mexico. One of their favorite methods of traveling was floating down rivers at night, “like logs”. They told tales about them running away with squaws. When I asked them what they were, they replied, not like a man and not like a spirit, but in between. One Indian, who must have been pretty well educated, said, “They have not come out of evolution.” With all the profound sightings reported it is probable that many sightings remain unreported. A friend of mine was fishing, He strung a number of trout on a stick and laid them on a rock. He walked down-stream and waded out into the river to continue his fishing. A little later he looked back and saw one of the hairy creatures picking up his string of fish. He was thrashing them against the rock. Some other friends were camped in the area. One morning they awoke to find their fire wood scattered along the trail, for a quarter mile. Once a friend and his wife saw an Apeman on the main road leading to Spirit Lake; Washington. He looked as though he was basking in the afternoon sun about 70 yards from the road. When his wife saw it, she began screaming. Then, my friend said, the thing just got up and walked away. I have told of my past experiences, and have tried to explain about the present sightirigs. What does the future hold regarding the Phenomenon of Abominable Snowmen? Perhaps some psychic will enter into their investigation. He will probably keep records and have reliable witnesses to observe his work and to report his findings to the world. Sightings of Abominable Snowmen have been reported at various times from every major continent. They were of different appearances and sizes and the records of them date back many years. Is there an interrelated race of these beings awaiting their proper day of evolution? I am of the opinion that evolution is not only a law of the material world, but also the law of all the worlds we cannot perceive by the medium of our five senses. Everything seen and unseen is life and all life is progressive and changing. Are these beings even now evolving by stages into a higher consciousness? Could they,indeed, be the missing link between man and the anthropoid? A link between material life and immaterial life? Will these beings who are wandering the earth today, and who present a weird image to us now, some day, some distant age from now, evolve into the noble ranks of human intelligence? The answer to these questions cannot be answered by expeditions. It can only come by man knowing more about his true self and more about the universe in which he dwells. Science has reached near perfection in material knowledge, but has reached the borderland through which no finite intellect can pass. All life can be studied, but man will have to look into himself to tap a spiritual power and realize the spiritual laws and reason with a spiritual mind. Man will have to break the little material shell he has around himself, which says this far you can only go and there is nothing more. What is outside that shell is pure life and it is even above and of an higher order than material life, though material and spiritual life would work in harmony if we would let it work. I have lived this experience with Abominable Snowmen. I have encountered them on the slopes of Mt. St. Helens. I have looked deep into myself to tell you of their nature. I have had both the earthly experience of encountering them by Ape Canyon, and the spiritual experience of knowing and telling what they are. I have walked through the messy cliffs of Ape Canyon, and seen a primeval loneliness, reminiscent of life as it must have been years ago. I have explored the distant future which beckons to us with hope. I have told you my story and it is true. Abominable Snowmen are a part of the creation. Will we hear much more from them? Will their habitat change from selected mountains to nearer our populous cities? I think they will. They are just one little mystery from the ocean of mysteries. Posted in StrangenessTagged Washington, Ape Canyon, Fred Beck, Gifford Pinchot National Forest, Glacier Peak, Lewis River, Mount Rainier, Mount St. Helens, Northwest, YeticommentLeave a Comment on 1924: I fought the Apemen of Mount St. Helens, Wa.